Today I want to share to you a good find of mine. I also created this review for Gale, who asked if she can see how the eyeshadow brush packs and deposits colors. This extra soft eye brush is great for applying all eye shadows. It gives great coverage from lid to brow. These brushes are designed to buff on the perfect amount of minerals for the most natural, flawless application. Only the finest quality of hairs are used to make buffing feel like second nature. Soft and synthetic --- made of vegan taklon. Packs traditional eyeshadow just fine. I know this was meant to be an MMU brush but I rarely explore MMUs, especially in the mornings when I'm almost, always running late. Brush covers the whole of my lid, so less applications needed. I find that the brush is larger than an average eye shader, IMO. Works best when eyeshadow is foiled. For some reason, it kind of messes a bit when used to apply dry shadows. 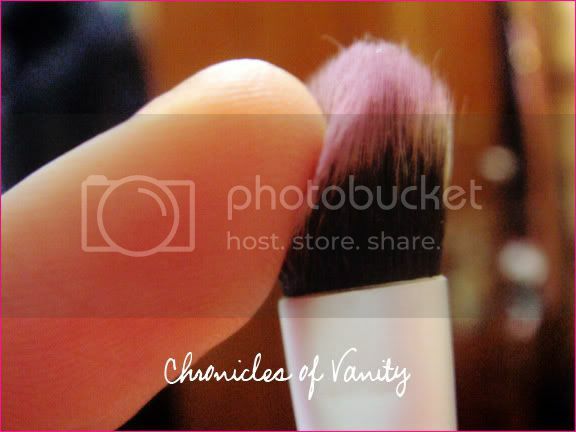 I rarely do this as I always wet my brushes before application, so this is a pro for me. Density is ok by my standards. The thing with some soft brushes is that they tend to be so soft they will just be so limp on your eyes and won't do the work. This VnM brush worked fine. However, the problem with synthetic brushes is that they seem to ignore the pressure that sometimes density is not even the problem --- then again, this should be a CON. Metal used in the ferrule does not seemed to be affected when washed. Good job! The mix of white bristles can be nice to look at but definitely not when it's used. 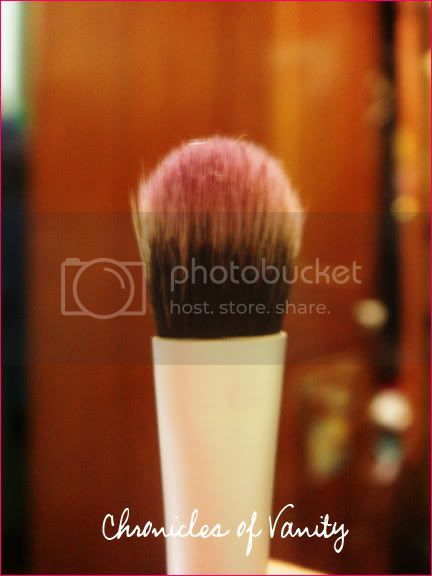 So now, even if I'm too lazy to wash it, I wash my brushes every after use. I'm not sure if this is okay but I can't stand seeing them dirty. 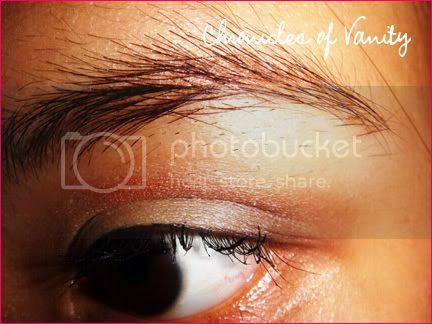 If you normally apply eyeshadows dry, it might be tough for you to use. Here's a little EOTD I made using this brush. Please pardon the untamed eyebrows. A close up of how the brush applies on the lids. for the crease and outer V.
Would I buy this again? No. I would love to try other eyeshadow shader brushes.